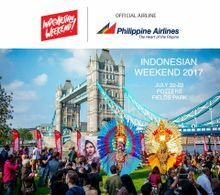 London's largest festival of Indonesian culture has announced Philippine Airlines (PAL) as its Official Airline partner for 2017. 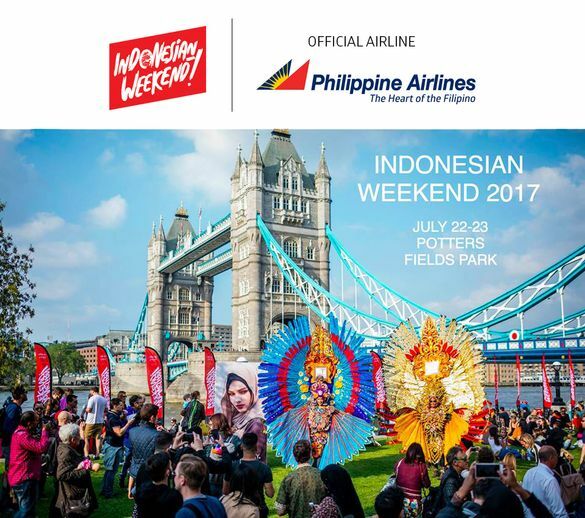 To promote Indonesia as a premium tourist destination, Indonesian Weekend will showcase the best the country has to offer on 22nd – 23rd of July at Potter's Field Park, beside Tower Bridge. Philippine Airlines flies non-stop daily from London Heathrow to Manila, where guests can connect to its eight weekly flights to Indonesian capital Jakarta and daily flights to Denpasar, gateway to Bali. Philippine Airlines, Asia's first airline and the country's flag carrier, operates an extensive route network of 45 international destinations spanning across Asia, Australia, Oceania, the Middle East, Europe and North America. Non-stop daily flights from London Heathrow Terminal 3 to Manila connect our guests to 30 domestic destinations in the Philippines and beyond. PAL is the Philippines' only full service carrier, with luxurious cabin amenities, inflight entertainment and connectivity, sumptuous inflight dishes, and heartwarming service. Today, the PAL fleet consists of 80 aircraft – Boeing 777-300ER, Airbus A340, A330, A321, Bombardier Q400 and Q300. PAL is the first Philippine-based carrier certified safe by the International Air Transport Association (IATA), and only airline with Business Class in domestic service. PAL will operate a brand new Boeing 777-300ER on the London-Manila route later this year. In 2016, PAL crafted a new corporate vision - to be a five-star airline. In support of this goal, a new brand philosophy was unveiled, embodying warm and caring service that can only come from the Heart of the Filipino. Indonesian Weekend is an annual two day vibrant and colourful festival of Indonesian food, culture and fashion, promoting travel to Indonesia by showcasing the best the country has to offer. To promote Indonesia as a premium tourist destination, there will be a beach created from 50 tonnes of white sand. The event will be held on the 22-23rd of July 2017 at Potters Fields Park in the heart of London, nestled between the icons of Tower Bridge, Tower of London and City Hall.